Off-line lab measurements of pH are often used for process control instead of in-line measurements. But as a hot process sample cools, its pH can change significantly. Relying on pH measurement of ambient temperature samples can lead to inappropriate and expensive process control. Contrary to physical parameters that can only be measured in the process, with analytical parameters there is a choice: in-line or off-line, and off-line is often the preferred way. But is it always the right thing to do? pH values are so important in and around a process that the number of grab samples required to run the process efficiently would take too much time to analyze. So relying on lab pH measurements prevents efficient process control. Moreover, the pH measured in the lab may not be the same as the process pH. Perhaps the most important variable that can influence the grab-sample testing of pH, is sample temperature. Samples taken from hot processes have usually cooled substantially by the time they are measured, and there is a common belief between both process engineers and laboratory personnel that this is not an issue because their lab pH meters are temperature compensated. The reason why a good pH probe is equipped with a temperature sensor is because its output is both pH and temperature dependent. A pH probe generates a mV potential proportional to the pH of a solution. With a glass electrode a pH sensor outputs 59.2 mV per pH unit at 25 °C. At different temperatures the output changes, even if the solution pH remains constant. Only at neutral pH 7 will the sensor show a steady 0 mV at all temperatures. The temperature dependency of a pH electrode’s output is clearly demonstrated in the Nernst equation. What no pH probe can ever compensate for is the temperature / pH correlation or behavior of a specific solution, as each solution has its own correlation. No pH sensor is capable of identifying what the pH of a hot process solution was when measuring in an ambient temperature sample, and vice versa. This frequently leads to frustration with inline pH sensors, as although the measurement difference is due to the temperature difference of the two solutions (assuming both sensors are operating correctly), the in-line measurement is usually blamed for being inaccurate. Due to the pH scale’s logarithmic nature, a discrepancy of a single pH unit implies tenfold the acidity or ten times the amount of chemical reagents required to control the process as needed. Relying on lab pH measurements may not only pose a significant cost issue because of excessive, unwarranted chemical consumption, it may also create the conditions for severe equipment corrosion and/or adversely affect the process and product quality. Another influence that temperature has on pH relates to the pH scale itself. That pH is measured on a scale of 0 … 14 is common knowledge. What is not so well understood is that the scale is applicable only at the standard temperature of 25 °C. At higher temperatures things change, and at roughly 125 °C the pH scale would actually be 0 … 12. This means that neutral pH is now at pH 6 and pH 7 would be alkaline! High temperatures are not uncommon in chemical processes such as in fertilizer production. In these cases, cold sample pH will differ substantially from the hot process value, leading to a different interpretation and therefore the very real risk of incorrect running of the process. METTLER TOLEDO pH sensors provide high measurement accuracy even in the harshest conditions, so you can always rely on their data for process control. The addition of Intelligent Sensor Management (ISM®) in the sensors brings additional benefits, including advanced diagnostics that predict when sensor cleaning, calibration, and exchange should be performed. 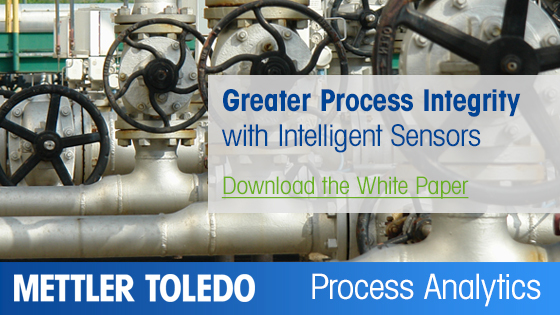 How ISM’s predictive diagnostics features can be integrated into your process control system.